SIPS AND SMILES. Musical friends Cate Lucas (left) and Kelsey Nocek are Red Tide. The folk duo met while attending UW-Stevens Point and played their first show on a whim. Their debut album is out now. Cate Lucas and Kelsey Nocek met years ago at UW-Stevens Point. It was one of those things where you see a person around campus, in classes, at the climbing wall, making small talk … they’re just around. Soon enough, they were traveling together down to Madison for Freakfest, a huge costume party and music festival, and before long the two were friends – just like that. Their fast friendship was punctuated by jam sessions in dorm room stairwells, learning music together, traveling around, exploring, getting to know each other better and better. Then they took a Thanksgiving weekend trip to Florida during the red tide – where typically agricultural runoff seeps down the Mississippi into the Gulf of Mexico causing a dense concentration of algae to bloom turning the water a reddish brown color. The red tide was so thick at the time, Nocek couldn’t stop sneezing and coughing. Watching some live music on that trip, Nocek abruptly turned to Lucas and said “Hey, we should be a band.” The name Red Tide stuck. At a Stevens Point café after returning home, the barista noticed Nocek’s guitar slung on her back and encouraged the two to blow off their studies and play some songs for the customers. They obliged and performed for a little while, and the shows kept rolling in after that. Red Tide started writing more, performing all over the place, and having a good time doing it, but they found themselves at a crossroads. With Nocek graduated from college and Lucas about to metriculate, they had to figure out what would come next. Do they try and do the music thing full time or split up to navigate separate roads and careers? So that’s exactly what they did. They found their niche in Eau Claire, played shows around the Valley, kept writing, recorded some demos, met tons of friends, and did it their way. “You can be you, even if people want to you to do different things or be a certain way, you have the freedom to be yourself,” Nocek said. That spirit carries itself through lots of Red Tide songs. It makes complete sense that a band whose existence came about so naturally and organically would center in on their own way of doing things. And now, with the release of their debut album Naked We Came, Naked We’ll Go, that theme threads itself through the 14-song catalog of emotionally vulnerable songs about wanderlust, exploring yourself, seeing the world, and searching for something. After raising a chunk of recording cash via Kickstarter, Red Tide explored a number of recording studios in the area, and vibed the most with engineer Brian Joseph at Hive Studio. They met up in September on the day of the solar eclipse when the surrounding nature was still and there was a strange energy in the air. “We were just talking, and Kelsey and I were razzing each other a little bit. And he chuckled and he was like, ‘I like you guys; I just hope I like your music.’” Lucas said. They pounded out 14 songs in two days, later adding in drums (Sam Keinetz), fiddle (Georgia Rae), and bass (Jeremy Boettcher). The duo found that by harnessing the natural vulnerability that comes with playing music, and allowing themselves to physically be vulnerable in the space, the recordings were taken to the next level. You can feel it in the album. 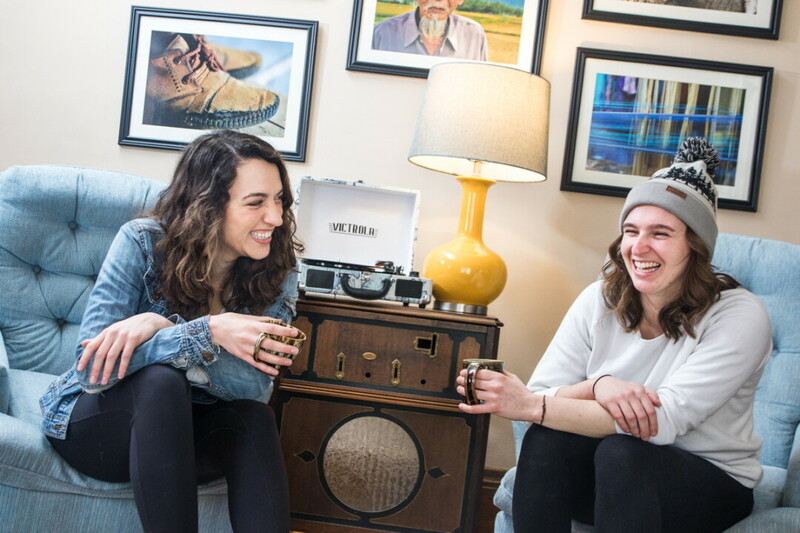 After a very successful February release show, the duo – after taking a quick, well-deserved breather – are ready to keep at it and transition into the next step of their musical journey. What does that mean exactly? Well, that’ll take some figuring out. To learn more about Red Tide, visit redtideduo.com and purchase Naked We Came, Naked We’ll Go online or in-person at The Local Store.